Brick walls are probably the most common building elements in construction of a house in India. These walls form basic units for creating rooms that make up a house. The walls besides being space dividers are also structural elements that transfer the load of the roof to the ground. Brick walls are constructed on strip spread or raft foundations that support the walls. The walls are constructed using bricks and mortar. These can also be constructed with various structural qualities and thicknesses. Brick walls are constructed by joining bricks with cement mortar in arrangements called English Bond, Flemish Bond or Rat Trap Bond. These bonds give different external appearances to the wall. All construction systems of brick walls are such devised that vertical cross joints in any layers are staggered. The bricks thus bonded form a solid mass that does not split when the wall is loaded with live loads and dead loads. The classification of brick work according to the quality of brick is following. First class brick work is made by using first class bricks and cement mortar. This brick work is used for load bearing walls. It is made in rich mortar in which the cement and sand ratio is from 1:3 to 1: 6. Second class bricks work is made by using second class bricks and cement mortar. These bricks also have the property of first class bricks but are not very regular or even in shape. These bricks should not be used for load bearing walls for more than two storey buildings. 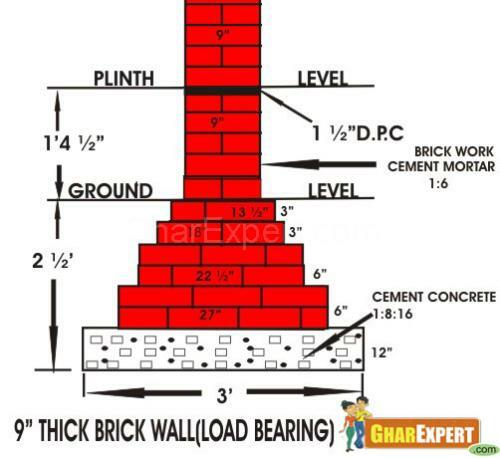 Second class bricks have minimum crushing strength 70.kg per sq. meter. This type of brick work is made by using third class bricks and cement mortar or mud mortar. 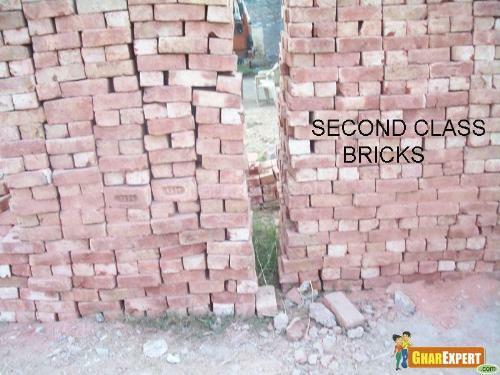 Third class brick work is not made in any Govt. work. Generally this type of brick work is made for temporary work in private sector. Mortar is a mix used to bind brick, stone etc to each other. It can thus be seen as a binding material that bonds bricks, stones to make a wall or for cladding purpose. Normally cement mortar is used in brickwork in present day construction though lime mortar can also be used but it requires superior craftsmanship and is hence infrequently used. Cement mortar is a mix of cement and sand with water. The cement is binding material which requires sand as a filler material. This cement mortar mix in wet state is plastic and binds two materials when it dries. Mortar is generally defined as 1:2 or 1:3 or 1:7 etc. This means that one part of cement is mixed with 2, 3 or 7 parts of sand. The following steps should be taken carefully while mixing materials for cement mortar. The mix should be made on a dry, clean, flat surface. The mix should be as per specifications. The mix should be by volume. The quantity of water should be such that the mix can be easily spread over bricks or applied on a vertical surface. Water more then required quantity may spoil the mix and it can reduce the strength of masonry. The mix should be used within half an hour of its preparation. Brick wall foundations are normally made as strip foundations. These are continuous along the length of wall and hence called as strip foundations. These form structural components of construction system by which the load of whole building is transferred to the ground. Foundations are made in dug out trenches so that a hard stable surface on which the building is supported can be obtained because the top surface of the ground normally does not have load bearing capacity to take the load of the building. The other reason is that foundations can by this method be hidden from view. The architect needs to provide a foundation plan that indicates exactly where the foundation trenches are to be dug. The foundation trenches are dug after being marked on center line principle on the site according to architect’s drawings. The size of trench varies with the thickness of walls and the load bearing capacity of the soil. The base of dug trench is rammed to solidify the surface. On rammed surface a layer of cement concrete is laid. This is normally 6 to 8 inches thick. This base concrete layer needs to be cured for it attains its expected strength. Base concrete layers or courses of bricks are laid to create a stepped base that would help in distributing the load over a larger surface of the foundation. The marking of foundations must be absolutely accurate as the location of walls depends on these markings. The trenches should not be dug in rainy season. The bricks, mortar mix and cement concrete mix should be as per specifications. The width and depth of the trenches depends on loading and soil conditions. As the foundation is an expanded base to distribute the load coming on it over a large area on ground. 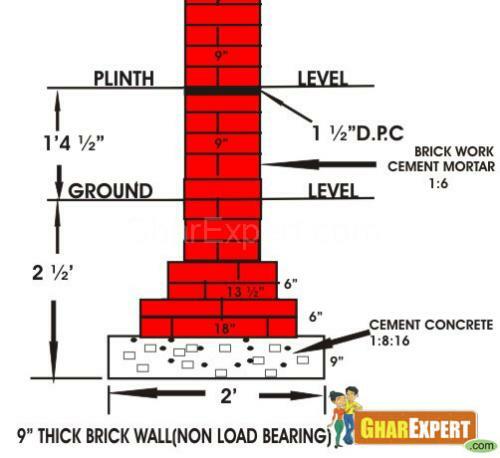 The width of the wall foundation depends on whether the wall is a load bearing wall, a non load bearing wall, a partition wall or a toe wall. The walls that support beams and roof slabs. These walls take the load of super structure and transmit it to the ground through foundation. These can also serve the purpose of dividing the space into required rooms etc. These are also accommodating door and windows where required. These are of 9” or more thickness. Such walls are made in first class bricks and rich mortar. These walls serve the purpose of dividing the space into required rooms etc. These can be made into thin sections to save the space. Non load bearing walls are only partition having no load of super structure so these can be easily changed whenever required to change the space of the room. These walls are made 3 inches, 4.5 inches and 9 inches thick as per the requirement of the site. The word super structure used in construction work means/denotes following. Brick work from DPC level to the roof level/slab level. If columns provided in drawings then RCC columns to be laid. Rain water pipe is to be embedded in walls. Fixing doors, windows and ventilators frames in walls. RCC (Reinforced Beam & slab for roof) including M S Steel bars according to the designs. Tile terracing lay with brick tiles on the top of the roof slab. Fixing doors and windows shutters. Fixing cupboard in the rooms and Kitchen etc. Fixing iron grills for safety of the house. Providing cement plaster on ceiling and walls. Laying floors including base coat. RCC slab laying is one of major step in any type of construction so it is mandatory to know all the points related to laying RCC slab. Here is a detailed article with all the information regarding procedure of RCC slab /roof laying . Cupboards construction using different materials: Brick and Wooden Cupboards, Just Wooden Cupboards, Mesh Cement and Wood. Today lots of options are available for cupboard construction. In the article here we will discuss all the material option available for making cupboard. Today lots of options are available for cupboard construction. In the article here we will discuss all the material option available for making cupboard.